I’m a day late, but I still wanted to participate in the CTE Weekly Photo Challenge for the letter H. I tried doing Heart using some Bokeh photography with a romantic setting for two, but after an hour of trying, I wasn’t pleased with the outcome. I then thought it would be fun to do Handwriting, but I didn’t have the supplies I wanted for the photo idea I had in mind. 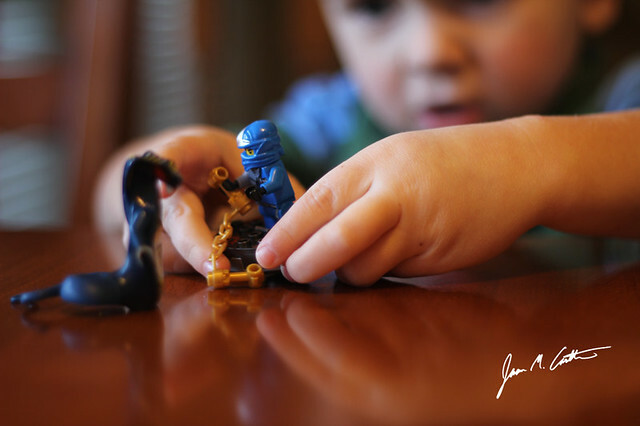 When I saw my son playing with his Ninjago guys on the table, I thought Hands would make a great letter H for the photo challenge. So after all the shots on Friday night for Heart, and then changing my subject to Hands a day after the photo challenge deadline, this is the photo I ended up with, and that I am pleased with. I must add that my son has so much fun playing with Legos. He spent about three hours of the beautiful Sunday afternoon sitting ON the table playing with Legos. He is passionate about his play, and it’s the funnest thing to hear him say, in his very serious voice “Ninjaaaaaa GO,” before spinning his guy and watching him take out this little snake guy. My boys just spotted this picture while I was looking at your blog. They named the Ninjago characters right off the bat! Love kids and Legos! I think there are so many fun shots to take with my son’s Legos. I have a few in mind for future weeks, so we’ll see how they turn out.